YEREVAN—Armenian Revolutionary Federation Bureau’s Political Representative Armen Rustamyan will lead the list of the party’s candidates for the December 9 snap parliamentary elections. Joining Rustamyan on the top three slots are ARF Supreme Council of Armenia chairman Arsen Hambartsumyan and Artur Khachatryan, who until last month was Armenia’s Minister of Agriculture. The ARF submitted its list of 152 candidates to Armenia Central Electoral Commission on Wednesday, which was deadline for all parties for political alliances to present their slates for the elections. ARF candidates, 22 of whom are not party members, will vie for seats both on the proportional and representative slates. The ARF has been vocal about its opposition to holding elections on December 9. It has said while the party is 100 percent in favor of snap polls, it viewed the short timeframe as a hindrance for instituting needed reforms to the electoral code. On October 29, parliament was just shy of one vote to pass the electoral reforms proposed by the Pashinyan government. The ARF voted for the reforms; however two of its members did not attend the legislative session. In addition to the ARF, 10 other political parties or alliances, known as blocs, have introduced slates for the 105-seat parliament. 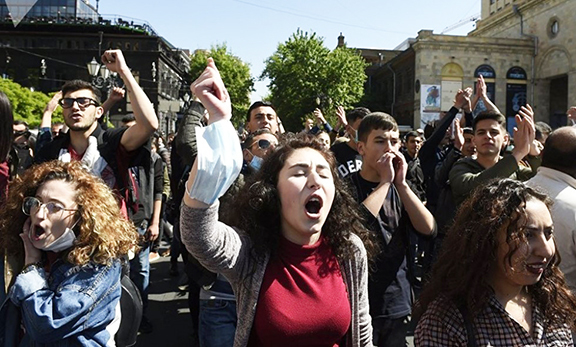 Leading the pack is Acting Prime Minister Nikol Pashinyan’s “My Step” bloc, which in September won more than 81 percent of the votes in the Yerevan municipal elections. Other parties and blocs represented in the parliament that dissolved earlier this month include the former president Serzh Sarkisian’s Republican Party of Armenia and the Prosperous Armenia Party headed by businessman Gagik Tsarukyan who headed an alliance of smaller parties and factions in the last parliamentary election in 2017 and won the second most seats in the legislature. The remaining parties and alliances are the Menk bloc, Bright Armenia Party, Christian Democratic Rebirth, National Progress Party, Country of Law Party, Citizen’s Decision Party and Sasna Tsrer, which until recently banned in Armenia. Official campaigning for the elections is slated to begin on Monday, November 26 with the actual election being held on Sunday, December 9.